As many of you may well know Benefit Cosmetics Have launched a brand new mascara called Roller Lash and I was super excited about this new launch as I love Benefit Mascaras and think they are amazing. First thing to note about the mascara is the wand is curved which fits the around the lashes a lot better so every eye lash gets coated with mascara. The mascara also claims to curl your eye lashes without a use of an eye lash curler which lets face it will save you a minute or two in the mornings. I also like the formula of the mascara its water proof and ink black so it will stay on the lashes all day without smudging or flaking off. The mascara also is easier to remove than the benefit they're real mascara which is great. The mascara also retails for £19.50. As you can tell my eye lashes are very straight and short so without mascara you can barley tell I even have any. I have to say the mascara does make a difference to my lashes by giving them volume and length and the mascara also has curled my lashes and the curl holds in place all day. 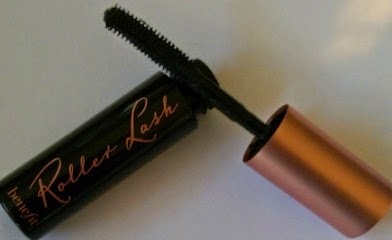 I have to say this is my new favourite mascara and once my sample runs out I'm going to be purchasing the full size.